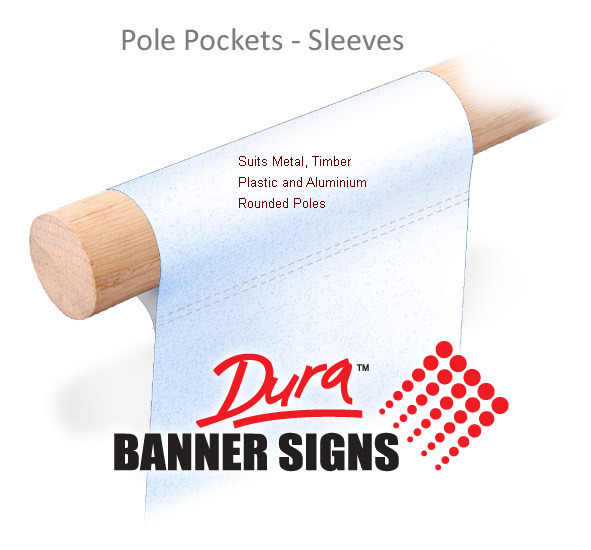 Pole Pockets are used to hang banners by sliding a rounded pole inside the sleeve. You can choose horizontal pole pocket sleeves for hanging a banner or choose vertical pole pocket sleeves for lifting a banner. Typically, a vertical pole pocket sleeve is closed (capped) at the top so that the pole does not extend past the top of the banner. Hanging banner poles use a little distance past so you can hang with chain or cupped hooks leaving your graphic media clear of each edge. 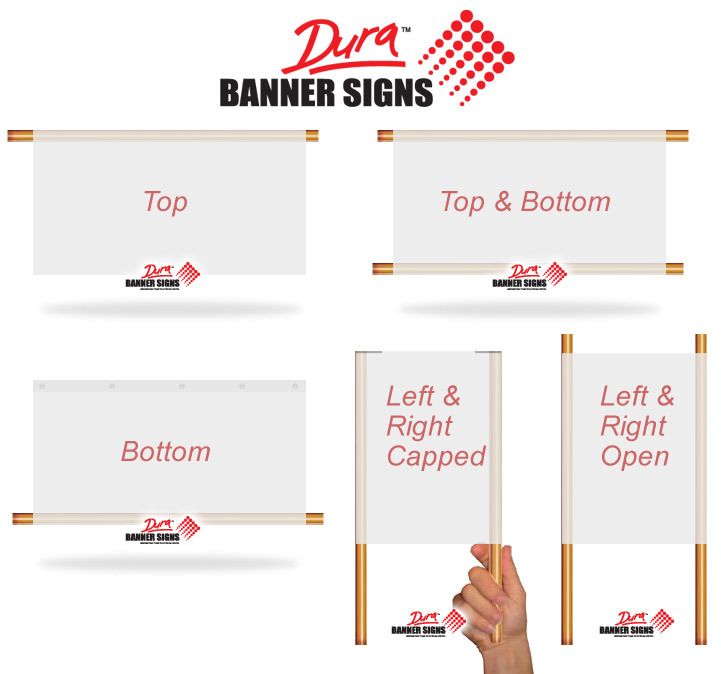 Carrying your banner with two people, choose left and right pole pocket sleeves. Indoor displays and large format shopping centre mall displays. Window Banners - Prop backdrops, visual merchandising backers, window dressing displays and more. 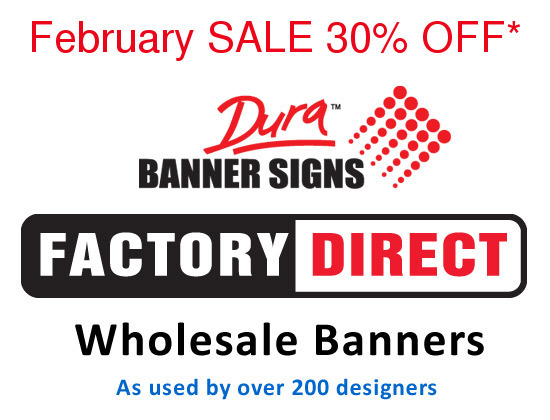 A window banner sign is important for passing traffic and window dressing impact. #1 Do you supply the poles. NO, Shipping is prohibitive, please see your local hardware store. #2 Choose the DIAMETER of the pole, the pole pocket sleeve we supply is slightly larger so that the pole diameter you choose glides inside the pocket sleeve easily. #3 Capping: Vertical (Left & Right) pole pockets -sleeves are automatically capped to prevent the poles extending past the banner. If you require the poles to extend, you may need to unpick the seam. 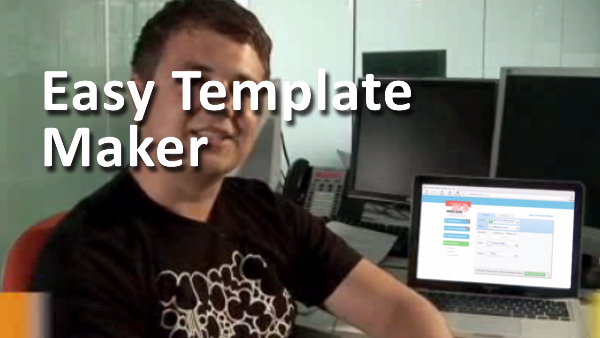 Choose at Calculator and Easy Template Maker. Use Pole Pocket Sleeves to assist you swapping over your graphic media and lowering installation costs. Hanging banners or displays is easier and gives you more scope to creatively place advertisements inside your store, on walls, hanging ceiling banners, freestanding displays, behind counter and partititions. WINDOW BANNERS are important for shop owners and visual marketeers. Using a pole system with sleeved banner signs is easier. Eyelets Grommets are machined inserted and pass through the material hem not the sleeve. Printing supply only, we do not ship poles.